It is better to be early than late in recognizing the passing of one era, the waning of old investment favorites and the advent of a new era affording new opportunities for the investor. For many quarters we have been discussing changes unfolding within many big-picture economic and investment trends. The table below summarizes the situation as we see things. Taken as a whole, we believe the new trends will constitute a profound change in the investment climate for the next several years. And we expect this climate change will prove over time to be the friend to many investors. However, the churning in the stock and bond markets so far this year reflects unease about the new trends and their implications. Of particular concern by many is the transition in Federal Reserve (Fed) policy which is underway. As some prominent economists and advisors point out, the economic stagnation that has gripped Japan for decades now appears to be threatening the Eurozone. These same pundits fear the Fed’s bond buying actions and zero-interest-rate policy may well be the only factors keeping the U.S. from joining the secular economic stagnation club. The counter-force to these gnawing concerns and troubles rests with the resiliency of the domestic economic expansion. We believe the dynamism of the U.S. private sector that underlies the business expansion continues to be significantly underestimated. What is dynamism? It is the marketplace for ingenuity; where ideas constantly compete to meet the needs and desires of mankind by delivering new and improved products and services at increasingly affordable prices. It operates as an iterative process of constant experimentation that requires the willingness to tolerate success, failure and the displacement of the status quo. As we have discussed on prior occasions, the great news is that the ability for ideas to cross-pollinate into new idea “recipes” is unprecedented. The even better news is the “democratization” of this whole process. Thanks to never-before-accessible tools (many of which are provided by companies “we” own within portfolios), and an emerging ecosystem (crowd funding), the barriers to entry in the production process are falling, allowing more minds than ever before to participate in a meaningful manner. Many of the emerging trends identified in our earlier table exist because of private sector dynamism. 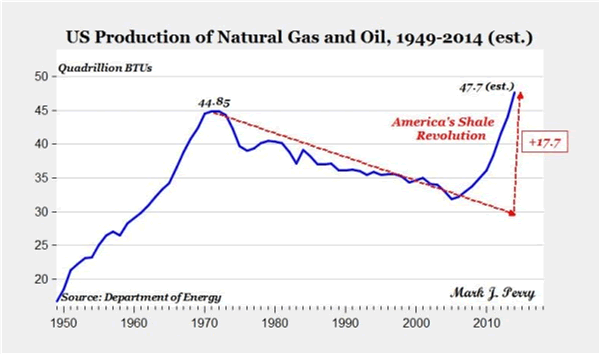 The revolution in the domestic energy situation (Exhibit 1) is the result of the ingenuity of intrepid, risk-taking experimenters—and a financial system that was willing and able to fund their ventures. Dynamism is driving the domestic manufacturing renaissance we have discussed on prior occasions (see for example last quarter’s Perspective, “Brainfacturing”). Technologically enabled productivity advancements, combined with changes in relative wages and the domestic energy situation, have shifted competitive advantages back towards U.S. manufacturing for many goods. The following commentary from a report prepared by the Boston Consulting Group (BCG) and their accompanying Exhibit 2 (below), documents the competitive shift underway1. ”“A worldview that neatly divided the globe into high-cost and low-cost manufacturing regions has served companies well for the past three or four decades. But as we have observed through the BCG Manufacturing Cost-Competitiveness Index, companies should view the world in a new light. 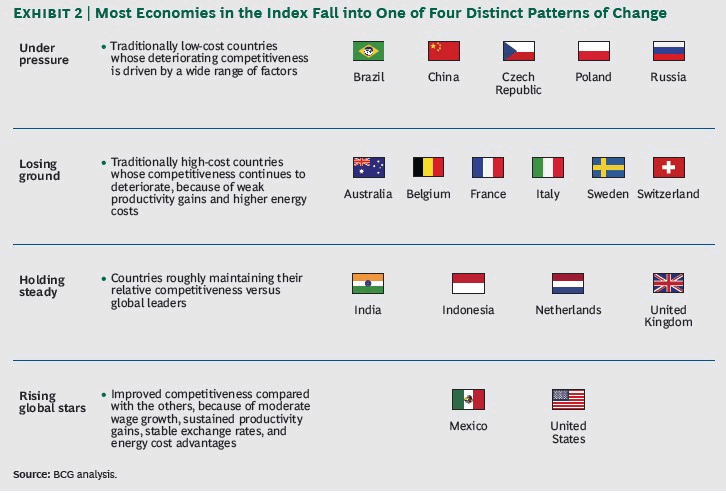 A decade ago, very few would have anticipated the dramatic and sustained shifts in wage and energy costs that have since taken place in the developed and developing worlds alike. ”“The world’s largest industrial fair is normally an occasion for German industry to celebrate its world-beating engineering prowess. But this year Ulrich Grillo, head of the BDI German industry association, warned an audience at the fair that German business faced a stark new challenge. “The global players are reordering the digital economy and Germany is losing touch with the global elite. We must do something to close this competitive gap with the U.S.,” he said at the fair in April. Chancellor Angela Merkel made similar remarks. Although Germany accounts for almost 6 per cent of annual global IT revenues, the country has struggled to create new global players since SAP, the business software company, was founded more than 40 years ago. Now, as its high-tech machinery and automobiles – the foundation of German success – becomes increasingly mediated by software and communication technologies, the worry is that the IT deficit could become Germany’s Achilles heel. “German industry has thrived on incremental innovation … [But] Germans are very poor when it comes to testing unfinished products early in the market,” he adds. German business culture is less tolerant of risk-taking and failure, compared with the U.S., and its bureaucracy can also be a hurdle, says German-born Florian Leibert, a former senior engineer at Twitter and Airbnb. In recent weeks German companies have gobbled up several U.S. companies. Coincidence? Maybe, but those transactions are not likely to be the last as foreign capital finds attractive opportunities here. The need and thirst for modern day tools that companies from all over the globe need to compete—like additive, computational, and direct digital manufacturing, material science advancements, software simulation and the internet of things—will likely only intensify in the years ahead. Lots of fertile ground for investors! ”“Estonia has been the top performing of the former Soviet colonies because Mart Laar, the historian who became prime minister in 1992 at the age of 32, had read only one book on economics, Milton Friedman’s “Free to Choose” and was in his own words “so ignorant” that he thought flat taxes, privatization and the abolition of tariffs and subsidies constituted normal policy in the West. Mr. Laar ignored the warnings from most Estonian economists, who told him what he proposed was as “impossible as walking on water”. There’s a common theme here. Germany’s postwar economic miracle happened because Ludwig Erhard abolished rationing and freed up markets in the teeth of expert advice. When the American general Lucius Clay said his experts thought these policies were a bad idea, Erhard replied “so do mine”, and did it anyway. When Sir John Cowperthwaite turned Hong Kong into a low-tax, free-trade enclave in the 1960s, he had to turn a blind eye to the instructions of his London School of Economics-educated masters in London. Another vivid example of the underestimation of dynamism comes from what is likely the most widely read economics textbook in history. Nobel prize winner Paul Samuelson’s Economics trained legions of students for decades. Exhibit 3 is from the 1976 (10th edition) from our own undergraduate years4. 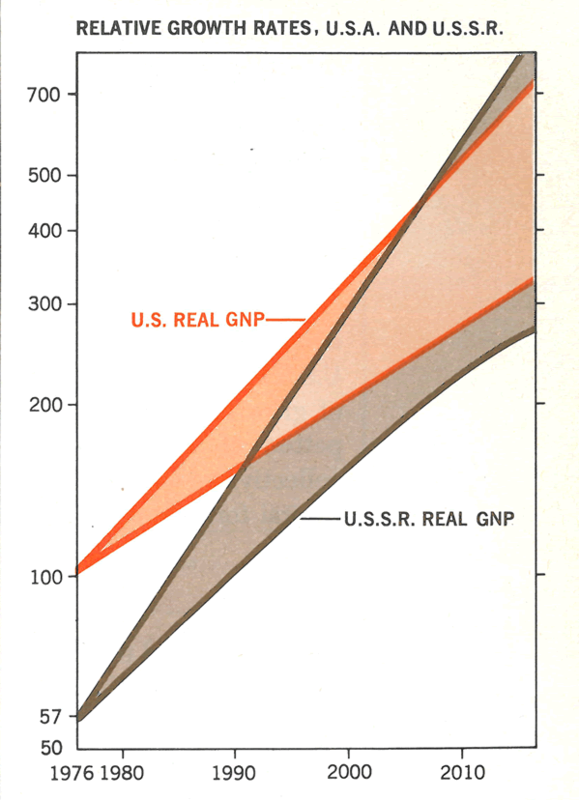 The exhibit’s graph reflects “best expert opinion” of the projected economic growth rates of the U.S. with its dynamic private sector—and its antithesis—the centrally planned economy of the former U.S.S.R.
“Expert opinion” expected the Soviet economy to grow, at a minimum, at a pace that would allow it to catch up and quite possibly exceed the U.S. economy by now. The actual outcome, of course, was very different to say the least. Exhibit 3: Many experts were very wrong about the power and potential of the U.S. economy in the past. Are similar mistakes being made today? The story of commodity prices in recent years is centered in China. Previously, weaker commodity prices were usually (correctly) regarded as a market signal of a weakening U.S. economy. Not anymore, as China had been the world’s commodity price setter for the past several years. Its building boom sucked in massive amounts of iron ore, cement, oil, etc. The increased demand pushed commodity prices higher and unleashed rising commodity inflation for the developed world. As we discussed earlier, dynamism has also been at work in the commodity area, with higher prices eliciting more supply. Now as overcapacity and a bad debt hangover appear to be setting in following China’s boom (see Exhibit 4), its growth has become much less commodity intensive. Commodity producing nations like Russia, Brazil, Venezuela, and Australia are feeling the pinch of this climate change. 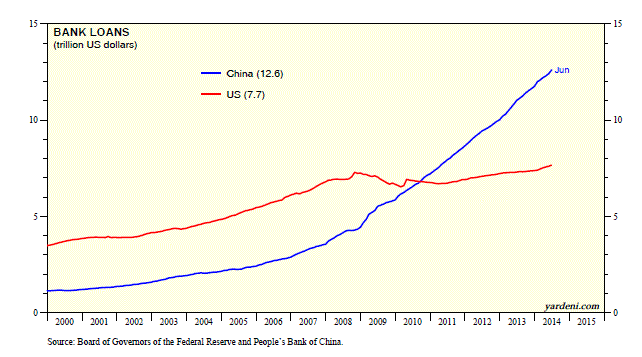 Exhibit 4: China’s financial system has fed the boom. Despite China’s economy being roughly half the size of U.S. economy, their bank loans exceed those of the U.S. banking system. ”“Capacity in the region was built for a world in which trade would expand indefinitely. But world trade has essentially been flat for three years now. That means it is not only commodity producers that are under pressure but manufacturers as well. Corporate Asia has levered up big time. “Conditions on the ground for cyclical and China-centric Asia high yield corporate bonds are now worse than in 2008,” notes Viktor Hjort, head of Asia credit research for Morgan Stanley in Hong Kong, adding that the “releveraging is unintentional. Most of these industries are battling excess capacity and eroding pricing power. Adverse credit events are becoming more frequent in property, mining and cement. For the U.S., however, lower commodity prices augment consumer purchasing power. This should prove to be another factor adding resilience to the U.S. expansion. Won’t Fed Policy Change Overwhelm Dynamism? Federal Reserve actions—including its bond buying (so-called “QE” for quantitative easing) and zero interest rate policy—were intended to fill the hole created by the collapse in private sector credit demands that occurred in the wake of the 2008 Financial Panic. But with private sector demands demonstrating healthy improvement for some time now, “crisis” Fed policy is no longer appropriate. Some important points need to be emphasized about Fed policy change. The low inflation backdrop, and stable-to-falling commodity prices just discussed, provides a runway of time to gradually shift policy. Just as there is a significant difference between jumping on the brakes in a moving car, and easing off the gas pedal that has been pressed to the floor, the speed of the trend change in Fed policy has very different implications for the economy. In 1937—which some economists fear is the blueprint for the period ahead—the Fed jumped on the brakes; the money supply sharply contracted for the second time during the decade, and the second savage economic (and stock market) downturn of the Great Depression era was the result. The Fed moving away from its zero interest rate policy is akin to easing up on the gas pedal. The odds of the Fed setting the stage for 1937 repeat, therefore, appear very low. Will the time come when the Fed will indeed have to apply the brakes? 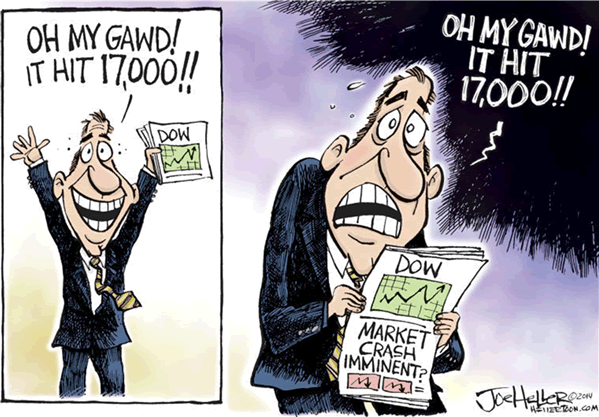 Yes, but the economic conditions that would warrant such actions are likely several years down the road. While dynamism is on the upswing and private credit demands are indeed rising, this is still occurring within the context of a slow overall growth environment. Wet blanket policies from Washington D.C., and the still cautious mindset of consumers and businesses as a fallout of the 2008 Panic, remain as restraints on the economy’s growth rate. In addition, climate change includes a much improved posture of consumer balance sheets in general, a rising savings rate, modest net debt at the corporate level, and lean inventories of most goods. Unlike China, Japan and the Eurozone, our banking system is no longer excessively leveraged. In fact, the U.S. banking system is now better capitalized than it has been in decades. These are not the conditions of accumulated excesses (unsustainable debt loads and rising inflation) that make an expansion brittle. And for those worried that student loan debt is a ticking time bomb, we offer a differing perspective in the attached appendix. Can the Stock Market Handle Higher Interest Rates? We believe the prospects of a long economic expansion, a long upward trend in corporate earnings, steady gains in employment, low inflation, favorable demographics and the climate change trends create a favorable backdrop for a continuation of the bull market for many U.S. traded stocks. Markets rarely move in a straight line, of course, so setbacks and periodic bouts of heartburn will occur along the way. As implied earlier, the collective “psyche” remains somewhat fragile and stock prices in the short run ride on the sea of investor emotions. However, fundamentals in the form of earnings growth and cash flow are the ultimate locomotive driving stock prices. And the probability is high that these fundamentals continue not only to be favorable, but more favorable than widely believed. What about a rise in interest rates and the prospects for bond yields rising as the Fed’s zero interest rate policy end? Will higher yields be trouble for bond and stock investments alike? Caution in the bond market remains prudent in our estimation. Most bonds continue to have very little cushion to absorb even the relatively modest rise in yields that is likely ahead. With the valuation margin of safety of most bonds so slight, a defensive posture towards interest rate risk remains warranted in our analysis of the bond market. A much more favorable cushion against rising bond yields appears across most stock valuations. Exhibit 5 assesses the situation. The chart provides an historical comparison of the earnings “yield” of stocks (corporate earnings/stock prices) relative to the prevailing yield on bonds of average quality (“Baa” rated bonds). 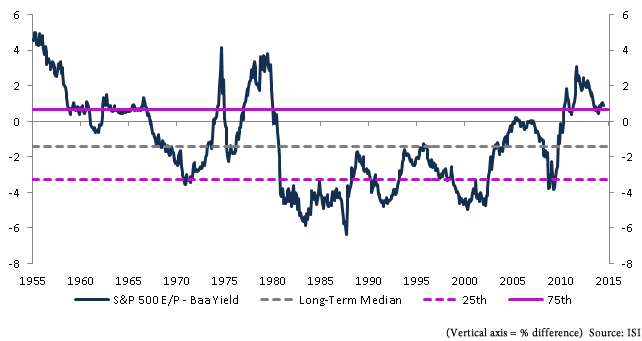 The message we glean from Exhibit 5 is that the current earnings yield on stocks exceeds bond yields by a healthy magnitude. The previous times (the 1950s, early 1960s, bear market bottom in the mid-1970s and the early 1980s) when similar magnitudes existed, favorable periods for stock investors followed. We suspect interest rates and bond yields could rise a significant amount before they become a serious issue for stock valuations. While the existence of climate change of our earth may well remain a controversial issue, climate change on the investment front is for real. ”“The conventional wisdom appears to be that the vast majority of student loan borrowers are being crushed because their loans are so large. The reality is quite different. Only 3.7% of those with student loans have balances in excess of $100,000. A very sizeable minority (39.9%) have student loan balances that are less than $10,000. As a result, the figure for the average student loan that is quoted in the press is very misleading. According to calculations done by the Federal Reserve Bank of Kansas City, the median student loan debt in the first quarter of 2012 was $13,662 while the average debt was $24,218! The vast difference between the average and the median reflects the impact of a very small percentage of borrowers who have very high debt levels. 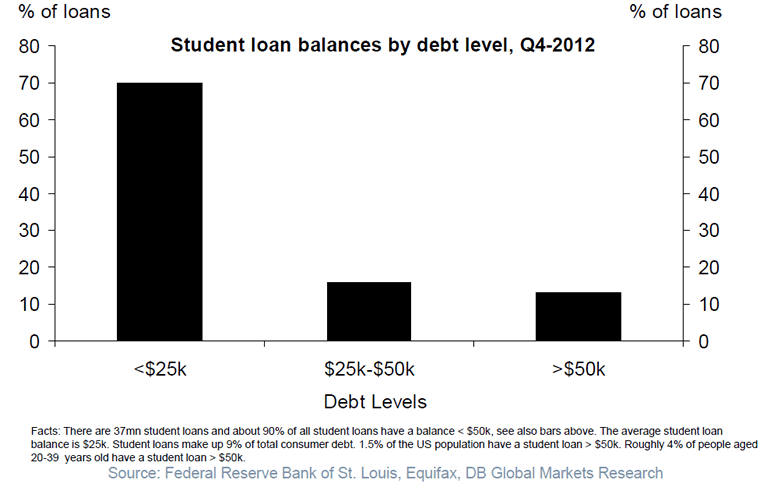 Another analysis of student loan data provides similar insight as reflected in the following chart. Student loans may indeed play a role in limiting the purchasing power of those with loan balances, but they are not likely to represent anywhere close to another sub-prime mortgage threat for the economy. The dynamic economies of the western world brought to ordinary people of varying talents a kind of flourishing – the experience of engagement, personal growth, and fulfillment. Even people with few and modest talents were given the experience of using their minds: to seize an opportunity, solve a problem, and think of a new way or a new thing. In short, dynamism’s spark created modern life. 2 Bryan, Chris, “Germany Plays IT Catch¬Up With the US”, Financial Times, 5 September 2014. 3 Ridley, Matt, “Dismal Europe Must Embrace Free Enterprise”, The (London) Times, 18 August2014. 4 Samuelson, Paul, Economics , page 883, 10th edition, 1976. 5 Sender, Hanny, “Emerging Markets Will Struggle to Ride U.S. Recovery”, Financial Times, 26 September 2014.